IS CBD the Next miracle Elixer for skin? ​Will HB jump on the CBD bandwagon? Everywhere I look lately, I’m seeing CBD (cannabidiol) being introduced in ALL kinds of products. Many of you have asked me when we would begin developing products with tjis ingredient. Here in California, standards are being developed for testing Cannabis products, but not yet for CBD products. I am researching the testing and quality control standards of various vendors to understand that side of the house. There are also many restrictions on accepting/processing payments for CBD products. As for the benefits of CBD in bath products, that’s what I would like to find out. CBD is a compound found in the Cannabis plant and is non-psychoactive (it can’t get you high, like its close relative THC). It is I’ve been watching this product over the last few years and researching potential benefits to my customers. Scientific research is showing CBD and exhaustive list of health benefits from its use (i.e. pain, inflammation, psoriasis, epilepsy to name a few). My goal has always been to provide natural healthy alternatives to commercially produced chemical laden products. ​I have heard about the many benefits of CBD oil taken orally, vaping, edibles and topically. Since our business is all about the skin, I’ve focused my research on topical application. CBD is absorbed through skin pores with topical application but will not enter the blood stream through this method. ​So, can loading up a bath bomb (no pun intended) or adding this miracle oil to salves really provide the great benefits I’ve been hearing about? How about blending the benefits of this miracle with other miracle herbs and tinctures? Well, I’m headed off to do more research and will let you all know how that works out. I’ll be working on bath soaks and muscle rubs and I’m expecting it to be a very RELAXING experience (j/k). Hopefully the relaxation carries over into all of the regulatory requirements & payment processing. During this time of year dry chapped lips are a real nuisance. The peeling skin not only feels terrible but also isn't the best look either. Exfoliate for smoother healthier lips. Get soft smooth lips with this simple DIY Lip Scrub Recipe in a flash with 3 ingredients. 7. Wah-Lah Smooth Soft Lips! I noticed a definite nip in the air this morning, letting me know that fall is here. Of course the falling oak leaves in the front yard should have been an indication a couple of weeks ago, but I decided to blame it on the California draught. Yes, I was in denial, but who would blame me? I am not a big fan of winter AT ALL and Fall is the segway to winter. With Fall comes another change in the environment that effects how we care for our skin. Our tootsies are about to leave those sandals and flip flops behind and be hidden away in boots and closed toe shoes for the next 5 or 6 months (depending on where you live). Out of site is out of mind and for most of us that means neglecting our feet for the season. One benefit of hiding those tootsies away is that unlike Spring and Summer, cracked heals are usually not a problem. However, you will begin to see an increase in dryness, fungus, ingrown nails, callouses and blisters/bunions. Over the next week, I’ll cover natural ways to battle these winter toe blues. For now, take time to enjoy the beautiful scenery changing around you. As lovely and skin loving as bar soaps are...it is often hard to convert liquid soap users over to the bar. Some people hate the goopy mess that can happen with a bar left in wet shower. Solution: Use Soap Savers keep the bar out of direct sprays of water when not in use and let the bar dry out between uses. Simple. But I have yet to come up for a solution for those folks that hate the feel of the slippery bar for hand washing or despise the look of that soap bar on the counter with the inevitable drainage puddle that occurs underneath "as it drains"...UNTIL NOW! But wait, these guys came up with an improved design. 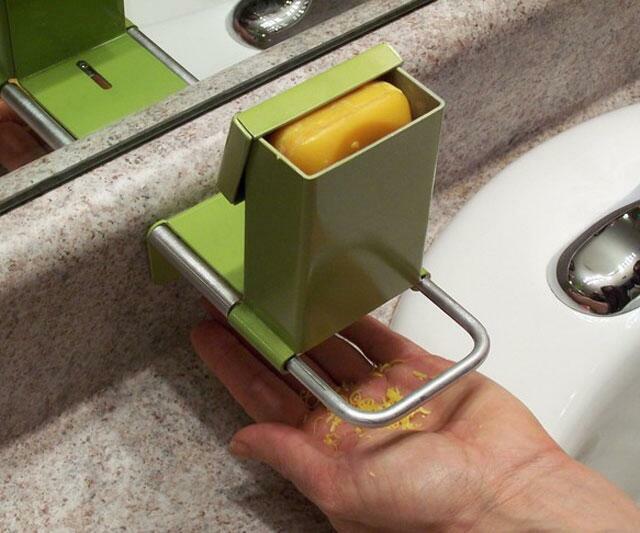 Super Shaver Soap Saver, but these guys have stopped selling and are reevaluating there production model. So we will continue our search until we find one or build it ourselves.